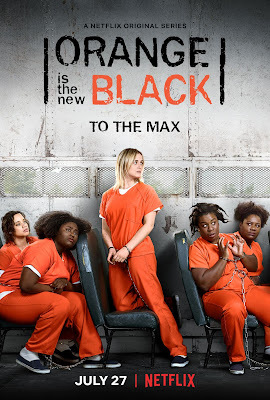 "....'Piper Chapman' (Taylor Schilling), a woman in her 30's living in New York City is sentenced to 15 months in 'Litchfield Penitentiary', a minimum-security women's federal prison in upstate New York. Piper had been convicted of transporting a suitcase full of drug money for her girlfriend 'Alex Vause' (Laura Prepon), an international drug smuggler. The offense had occurred 10 years prior to the start of the series and in that time Piper had moved on to a quiet, law-abiding life among New York's upper middle class. Her sudden and unexpected indictment severely disrupted her relationships with her fiancé, family and friends. "In prison, Piper is reunited with Alex and they re-examine their relationship. Simultaneously, Piper must learn how to survive in prison and how to overcome its numerous, inherent struggles. Episodes often feature flashbacks of significant events from various inmates' and prison guards' pasts. These flashbacks typically explain how the inmate came to be in prison or develop the character's backstory. "The show also pays close attention to how corruption, drug smuggling, funding cuts, overcrowding and guard brutality affect the prisoners' health and well-being and the prison's basic ability to fulfill its fundamental responsibilities and ethical obligations as a federal corrections institution. "One of the show's key conflicts involves the prison 'Director of Human Activities', 'Joe Caputo', whose efforts and aims as a warden constantly conflict with business interests..."